The Center for Auto Safety has found complaints from 120 consumers who described either their Kia or Hyundai vehicles bursting into flames for no apparent reason, the safety group says in a petition they recently sent to the National Highway Traffic Safety Administration (NHTSA). In another 229 complaints, consumers describe smelling a burning odor and finding melted wires in the engine bay. 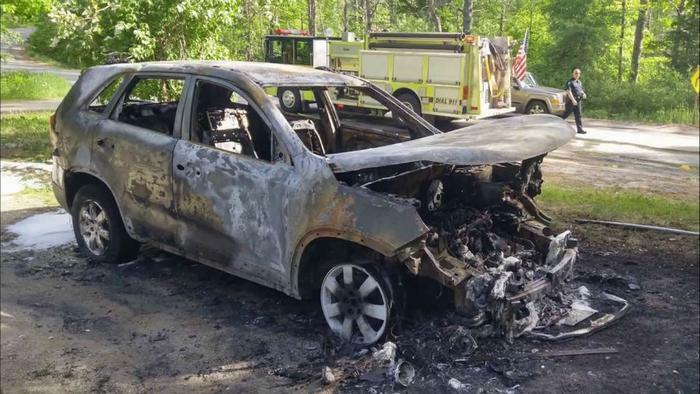 The group is asking NHTSA to investigate and possibly recall cars that it warns can become engulfed in flames for no apparent reason. “Complaints submitted to NHTSA via Vehicle Owner Questionnaire (VOQ), and to other sources, reveal a frighteningly large number of these vehicles manufactured at the same time catching on fire,” the Center for Auto Safety says in its petition. The fires have happened without any preceding crash, according to the complaints reviewed by the safety group. “The vast majority of complaints which discuss the origins of the vehicle fires state that smoke and/or flames are first seen emanating from the engine bay, then the car is quickly engulfed,” the Center for Auto Safety adds. NHTSA has 120 days to respond to the petition.